Make memories this year with dad in Pigeon Forge. Celebrate dad this Father’s Day with a trip to Pigeon Forge and the Great Smoky Mountains. From hiking and fishing to great food, amusement park rides, musical productions and so much more, you’ll find plenty of things to do in Pigeon Forge for Father’s Day. The Smoky Mountains offer miles of hiking trails through dense forestry, along quiet streams and to the peaks of magnificent mountains. Enjoy a picnic lunch or spend the day fishing for trout on one of the many streams or rivers that meander through the Smokies. You never know what you’ll see, so make sure to bring a camera and watch for wild turkey, deer and more! And plan your stay in one of our Smoky Mountain cabins to make getting out and enjoying the outdoors as easy as possible. 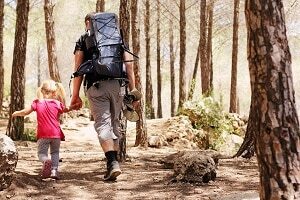 For those dads that are a bit more adventurous, Pigeon Forge is just the place to be. Get your adrenaline flowing with a ride on the mile-long mountain coaster at Goats on the Roof, go body-surfing in a vertical wind tunnel at Flyaway Indoor Skydiving or climb three stories high on the largest indoor ropes course at Wonderworks. 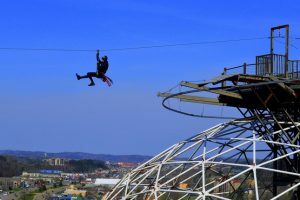 Get a skyline view of Pigeon Forge and the Smokies as you zipline across the 11 line course at Domes Zipline, one of Pigeon Forge’s newest attractions. 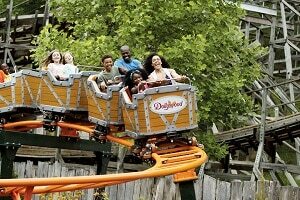 Summertime at Dollywood is back and better than ever with extended park hours from 10 a.m. to 10 p.m. From award-winning rides like Wild Eagle and Lightning Rod to The Dragonflier and The Great Tree Swing at Dollywood’s newest addition, Wildwood Grove, you can spend the day with dad enjoying everything the park has to offer. And when the temperatures heat up, there’s no better way to cool off than Dollywood’s Splash Country. Whether you prefer comedy, drama or magic, Pigeon Forge dinner shows offer fun and entertainment the whole family will delight in. Laugh until you cry at the side-splitting comedy offered up at Hatfield & McCoy’s Dinner Feud, in addition to Granny’s heaps of fried chicken. Or join in the celebration at Pirates Voyage Dinner & Show with amazing entertainers, rousing musical numbers and a fabulous five-course feast. 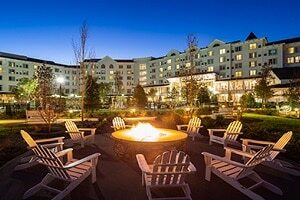 If you’re seeking a fun-filled Smoky Mountain vacation, Dollywood’s DreamMore Resort & Spa™ provides premium facilities, including indoor and outdoor pools, a unique restaurant experience and a full-service spa. Stroll into an island adventure at Margaritaville Island Hotel, inspired by the lyrics and lifestyle of Jimmy Buffett. Guests can enjoy live music on the deck along with a mouthwatering menu. Explore even more lodging options in Pigeon Forge to choose from. Make the most out of your special time with dad with a trip to Pigeon Forge. Explore even more fun and exciting things to do in Pigeon Forge this summer with the family.